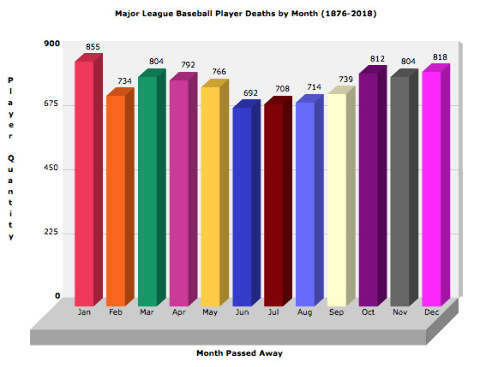 Baseball Almanac presents a list of baseball player obituaries and a comprehensive chart of ballplayer deaths by month. Chart note: All currently known deaths are included. Chart is current through date listed. Did you know that Baseball Almanac has a specific page for umpire burial locations, umpire gravesite photos and umpire obituaries online? Is there a baseball player obituary you would like to read? If so, send us an email and we will attempt to locate it and add it to the list above.